The first colour went on today! 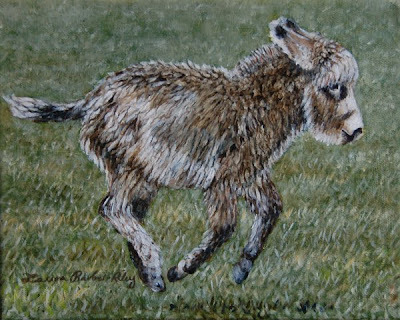 Most of my time was spent on the grass and the foal, but a quick glaze has gone over the adult donkey and the far background too. As always I'm struggling with the grass. The blurry but realistic look I want is so tricky to get! I'm reasonably happy with the texture and tone at the moment, it just looks a bit acidic. 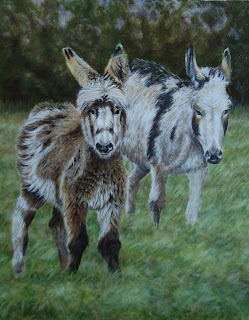 Going to leave it for now, once a few more glazes have gone on the donkeys they'll lose their stark whiteness and that will affect the way the grass looks so will re-evalute later! A start on the background at last. It actually doesn't look quite such a mess in real life, the camera has picked out the colours in the far background a bit strangely! 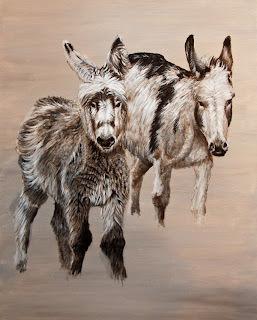 The first layer of underpainting detail is on both donkeys now. Before I do anything more on them I MUST get the background started... if I can finally decide exactly what I want to do with it!!! 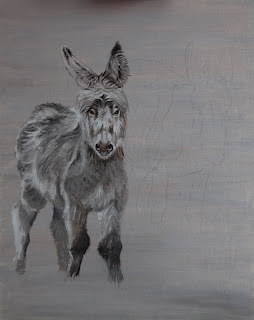 Spent quite a bit of time on this last night; roughly sketched in the other donkey and have made a start on the first layer of detail on the foal's chest and head. Yet to think of a title for this one so for the time being it is just 'Donkeys'. It is oil on linen, 20" x 18" (51cm x 46cm). I plan to complete a full grisaille underpainting for this one, so I'll eventually end up with a sort of black and white version of the finished painting onto which I'll apply glazes of colour. 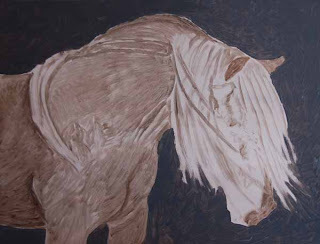 I'm using a burnt umber mixed with a bit of ivory black, and titanium white to complete the grisaille. 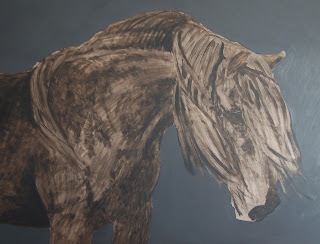 So far I have applied an imprimatura to the whole canvas and have roughly started sketching in the donkey foal. Should have started on the dreaded grass in the background first really, so no doubt I'll be whinging later that I wish I had, as usual! The great thing about working in this way as I can stop and start very easily without worrying about mixing colours up again and I'm using so few... very handy when trying to make the most of baby and toddler nap times! I have now taken 100s (actually, probably 1000+!) of rubbish photographs of 'Windswept' and have resigned myself to the fact that, if I want an accurate digital copy of such a dark oil painting, I'm going to have to get some professional help! I have been thinking of offering quality limited edition prints of my work for a while but to do that I need digital copies of the highest standard. 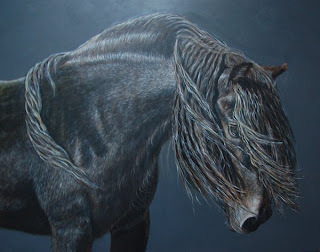 So, this has given me the shove I need and I'm planning to take 'Windswept', and possibly 'Arabian Filly' down to Newark to be properly scanned with a specialist fine art scanner. Can't wait to see the results; I hope to make the journey down there in the next couple of weeks. 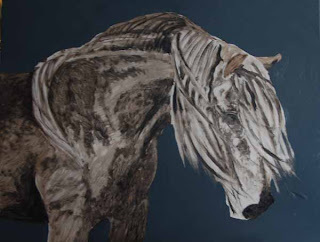 On a seperate note I have just joined the AAA- The Association of Animal Artists and I'm really looking forward to exhibiting with them later in the year. It's so nice to find some more opportunities to get my work in front of people in real life... even specially scanned images of oil paintings just don't look the same on a computer screen! This week has flown by! My two little Dales Pony mini paintings finish on ebay at 4:30pm GMT today. My experimental foray into ebaying has not been a complete disaster (I am at least not out of pocket!) so I'm not complaining. Better on someone elses wall than tucked away in one of my drawers! 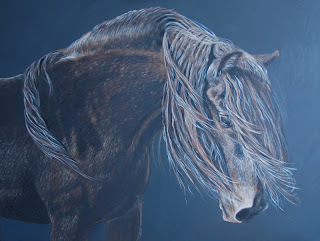 Painting wise I can't seem to leave 'Windswept' alone... I spent another couple of hours on it yesterday tidying bits up that were bugging me and then completely re-did a whole section of her shoulder. It looked better for it last night but no doubt the artificial lighting was hiding a multitude of problems and when I look at it in daylight today I'll find loads more to do! Part of me thinks I should stop before I ruin it but the other part of me wants to carry on until I'm 100% happy with it. 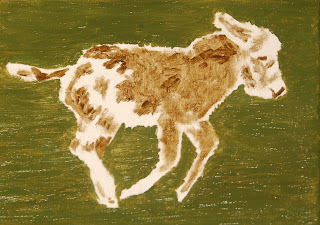 'On the Go' was the little 10" x 8" painting that I did in preparation for a larger donkey painting. I wanted to get a feel for painting that wonderful deep fleecy coat that young donkeys can have, and I think I learnt a lot from this painting. I'm pretty sure I'll take a different approach to the bigger one I have planned, and use a tonal underpainting for it to help me get the texture of the fur without compromising the colours in the coat and the shadows. There was a lot to think about painting the fleecy hair and I felt like once I had the texture right I lost the colour and shadows and then once I tried to correct it I lost the texture... and so on. It'll be much easier on a bigger canvas too! This was a really fun painting to do though, such a cute subject! Really looking forward to making a start on the real thing now. I love Sundays... a couple of child-free daytime hours painting with the smell of our Sunday roast in the oven ! 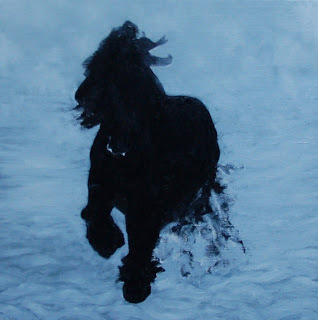 I quickly blocked in the pony in the snowy painting today (below) and then got distracted by 'Windswept' and ended up tinkering with that for ages... then planned to just stick a brown glaze over the donkey and pick out some shadows but ended up spending quite a while on it loosely applying paint. I hardly ever work wet on wet but I really enjoyed it- think I might challenge myself to do a few sketchy wet on wet paintings. This cute little fellow though will be in my usual style and I'll be adding more detail and refining it once it has dried, which will take a few days. Two small new original paintings started today... just the backgrounds blocked in really. 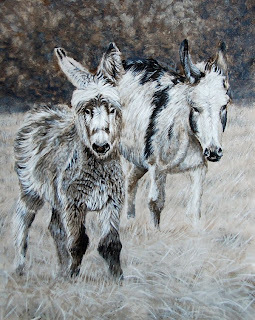 The donkey above is just 10" x 8" and a bit of a practice piece really before I paint a larger painting of the same donkey foal... if I can crack the fluffy coat well enough that is! 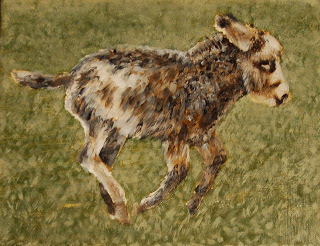 I have wanted to paint a donkey for absolutely ages but lacked a cute enough model until recently. 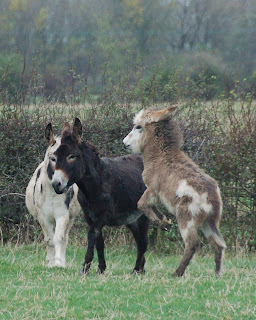 Driving along a few months ago I spotted a field of very scruffy looking donkeys so stopped and slightly sneakily took some shots of them! As you can see this foal was full of mischief and did a grand job of chasing his fieldmates around for me to get some interesting photographs of them all! The painting below is the first (and possibly last!) 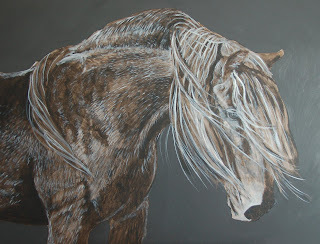 one that I am doing based on my trip to visit the Dales ponies in the snow. I was lucky to get some beautiful action shots but I'm not sure that they are going to make the best paintings... I am going to need to work hard to get depth into it otherwise I think it is going to look like a detail-less black blob on a white background! So, with the doubts in my mind I'm keeping it a small 12" x 12", on a deep canvas. 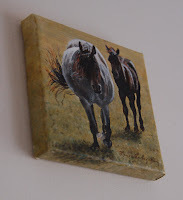 I have been meaning to have a go at selling my work on eBay for ages... but have been too chicken to risk it! What if it doesn't sell for enough? What if it doesn't sell at all and I get stung with fees all for nothing? So... if you fancy a bargain and a cute mini painting or two get yourself on eBay! 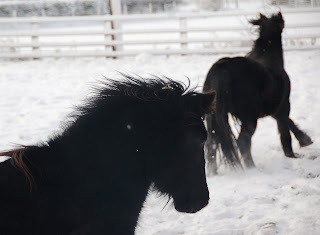 Not so long ago I took at trip to visit my favourite ponies at the Nipna Dales Pony stud here in Co. Durham. I'd really like to paint something from which to have Christmas cards printed from again this year; I now have plenty of reference photographs to help me do just that! 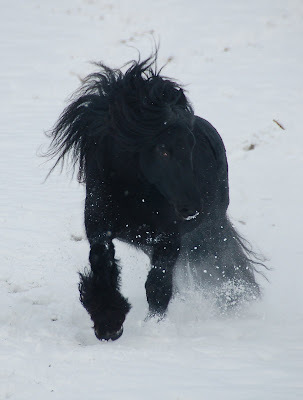 The ponies were the perfect models cantering in the snow and playing for the camera, it was a lovely way to spend the morning! 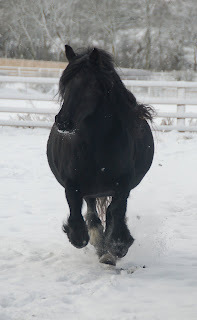 The stud have several foals due very soon, I can't wait to go and visit them!! Fingers crossed they all arrive safely. Well, finished for now at least! After another 3 hours work getting in the small details I have decided I'm starting to overwork it so have called it a day before I do more harm than good. Will revisit it in a couple of months with fresh eyes and a tiny paintbrush and tweak all the bits that are not quite right as I'm sure to spot plenty as the weeks go by! Have really enjoyed this painting! The photograph doesn't quite represent it as well as it could which is a shame, but it is the best of a bad bunch (I made my usual trip around the house photographing in different lights and places- about three times! ); I find dark coloured oil paintings the very hardest to photograph accurately. Just for you Steph I have put a detail pic below! So, in terms of time actually spent with a brush in my hand painting (and canvas prepping) this took me 18 hours. Overall time wise it took a week to prep the canvas and then 10 days painting including drying time between layers so 17 days in total to produce. Not bad really for such a big painting! 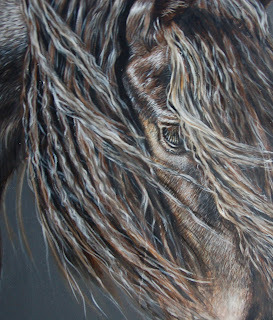 Of course there was the preparatory work, the reference photography that I took to work from, time with the ponies, sketches, the mini oil I did etc. too which was all work towards it but I'm not counting that! So, 1 down, 5 to go? Another 5 paintings before the end of May would almost seem do-able now, if it wasn't for commissioned work I need to get done too. Was a nice treat having this time just to concentrate on just one of my own paintings but I'm looking forward to getting on with some commissioned stuff too now so my originals will have to take a back seat again. Spent time on her nose today and started looking at the legs and chest a bit more. 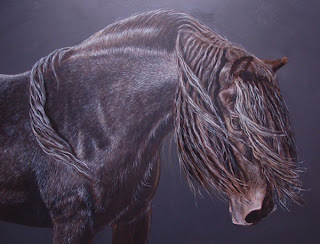 Have applied some browny glazes over the shadows in the coat over the shoulder/back to try and balance it out with the head and mane a bit but didn't end up getting the effect I wanted so I plan to put another layer of hair over the top to correct it. 1hr 45mins spent, 15 hours in total. I need to focus on her chest, legs, and nose as they have been a bit neglected so far. Will hopefully have extra child-free time this weekend while my husband is around to help out! 13hrs 15 mins spent on it in total so far. Another not very accurate photo of it but the glaze went on fine (phew! 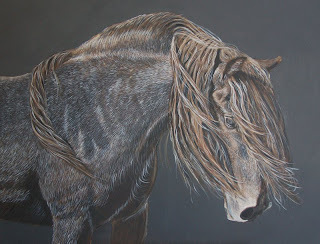 ), I'm now back to putting in more detailed highlights again... have done the face and mane (which will need toning down a lot) and started the body. Next step will be to finish the highlights on the body and then go over everything emphasising shadows before another glaze goes on. Another 1 hr 45 mins spent so now up to 12hrs 15 mins in total. Another three hours spent on this, painstakingly painting hair! I'm still working on the first layer of detailed highlights and have painted this whole layer in titanium white- once I'm finished I will apply glazes of colour over the top which will hopefully *fingers crossed* bring it all together and produce a natural looking effect ready for more detail to be added. It's just about ready for glazing now, but having spent so much time on the hair I want to make absolutely 100% sure it's dry- daren't risk washing off all my hard work!! So, I plan to carry on working into the highlights this evening (have just started going over her neck and picking out the stronger highlights again) and waiting until tomorrow before I apply some more colour. Don't think I have ever been so nervous about applying a glaze, I just hope it gives me the effect I hope it will! 10.5 hours spent so far. Not a great photo due to the terrible light but you get the idea! A dark glaze has gone over the top, a few shadows picked out and now it is on to the first of the real detail! 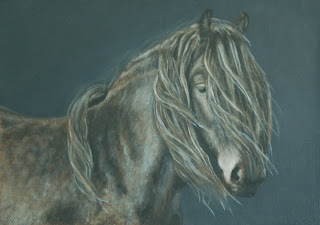 I have just been starting to work my way over the whole painting picking out highlights- face and mane done so far. Bit of a slow process with such a big canvas! Another 2.5 hours spent on it since the last update so up to 7.5 hours in total so far. Last night I quickly added a dark coloured glaze over the top (pictured below) and today my two little boys were kind enough to have a sleep at the same time so I actually managed to spend an hour sketching in the first rough highlights in white (above). 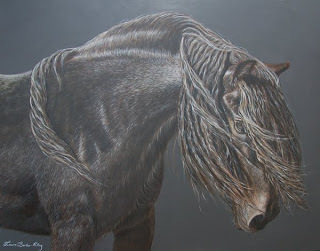 Still working quickly and loosely at this stage- I can't wait to get to the stage where I can paint some fine detail. Once dry another dark glaze will go over the whole lot and I'll pick out the shadows again. I need to correct the eye, I can see that it is far too small at the moment but should be very easy to fix. The waiting between layers drying is a real pain especially when I'm keen to keep going, but it suits the other demands on my time quite well I guess! 5 hours spent so far. Another layer on the background on today and main areas of shadow very roughly sketched in. Because it is such a big canvas I'm trying to work quite loosely on the painting as a whole at this stage to avoid it looking disjointed... normally I like to get quite a detailed drawing down in pencil first but in this case most of the 'drawing' will be done in paint as I go along. I don't mind this ugly stage of my paintings as much as I used to, and I feel like I have laid the foundations for this one now. Once it's dry again I'll slap on a dark glaze over the lot, and then start picking out some of the main highlights. 45 mins spent today so 3hrs 45 spent in total so far. 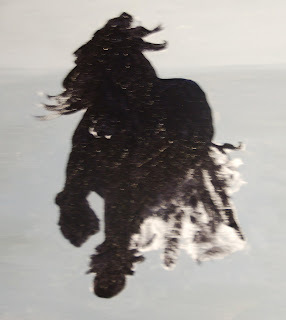 I actually did a little oil of the same pony in a different pose for an SEA charity fundraiser in November for Debbie Hounsome, a paraplegic rider hoping to to compete at the 2012 Paralympics. 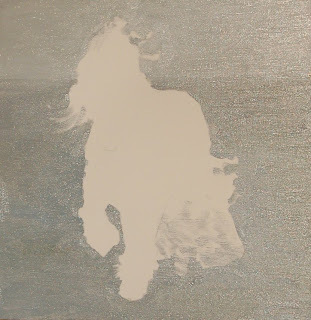 The painting (below) was a tiny 5" x 7" so I'm finding it interesting painting her at the other extreme size-wise! The last month has been a lovely break from painting for me, I'm now ready to get going again and full of enthusiasm for new original work I have planned! 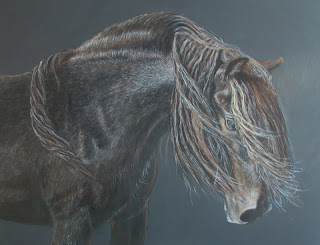 My first aim of 2010 is to get work accepted into the Society of Equestrian Artists Annual Exhibition again; the deadline for entries is the end of May so I need to get my skates on! Competition looks set to be even stiffer this year as the exhibition has been made an open one. On the plus side artists can enter 6 rather than 3 works so I suppose there is more opportunity to get up to 3 accepted... if I can manage to rustle up 6 before then (seems a bit unlikely to be honest!). So, I have made a start on my first original oil of the year today! It's a rather ambitious 36" x 28" entitled 'Windswept' which features a beautiful Dales mare owned by the Nipna Stud that I visited last year. I have never worked this big before- a blank canvas this size is rather intimidating so I have made a start by VERY roughly just slapping paint on to cover it a bit! I will be aiming to paint this with as much realism as I can, so I think I'll be working on it for rather a long time! People always ask me how long my paintings take me, and I never have a clue so I'm timing this one- 3 hours spent so far, including canvas preparation. I wish you all a happy and successful 2010!